I’m not sure how happy I am with this one. I like the diversity of kings I was able to represent, but I’m just not thrilled with the piece’s overall design. These rats just aren’t tied tightly enough together. It seems like they’re going to get a lot of mingling done before they realize their tales are intertwined. 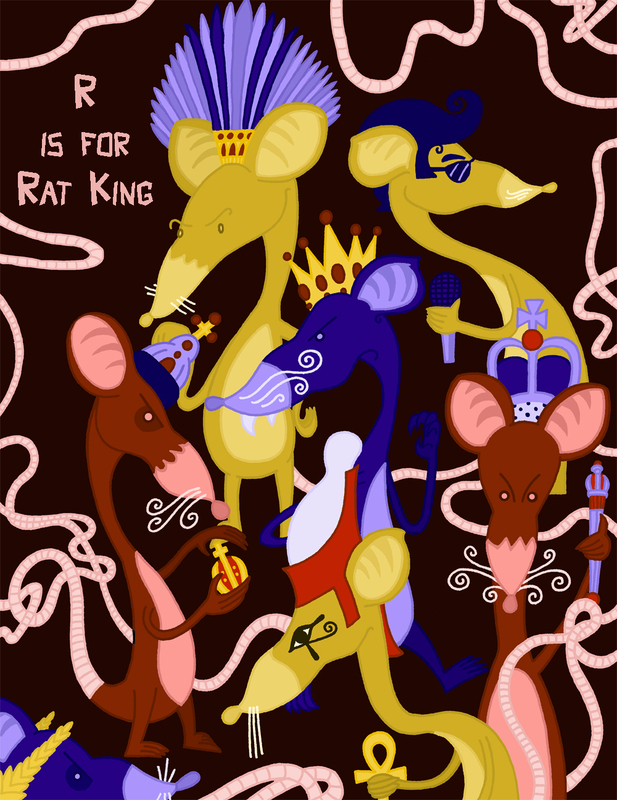 A “real” rat king, by the way, is a term for a cluster of rats who live in such close quarters that their tails get tangled up together. I think a quorum of seven is needed for a proper rat king. Anything else is a mere rat prince or regent or something. No one is sure if rat kings ever actually develop in the “wild.” There are museums around the world displaying big rings of desiccated rats, but the exhibitors (or the people who brought the rats to the museum) might have tied those tails together themselves. In any case, this all makes “the Nutcracker” a lot creepier.